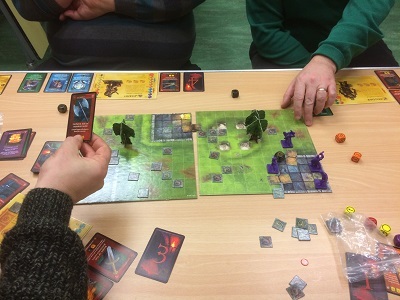 Tuesday night saw three tables up and running at the BAD Gamers, with the unusual twist of two of them being miniatures games and only one for Boardgames. Mark and Chris played a game of Frostgrave, with one particular highlight being the appearance of a giant worm right where a treasure was being looted. On the final table new lad Kent Yeomans joined Pete Gardner, Tiago Almeida, and Darren Stevens in a game of Kingdom builder. Which AGAIN Darren didn’t win. These must truly be the end times. 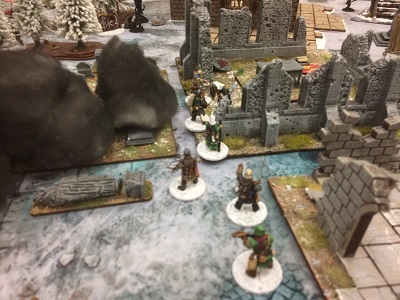 Frostgrave is a firm favourite in the club, with Dead Man’s Hand, a close second. Scrappers played surprisingly well. It comes from Osprey, and is a post apocalyptic gang level skirmish game. It’s more complex than Frostgrave, in both setup of the crews and mechanics, but still easy to pick up. The game became intuitive after a couple of rounds and as it relies on an opposed die roll approach, it keeps you involved no matter who’s go it is. The best part about it for starting is that we used existing Deadzone and Congo terrain plus some mixed SF figures we already had, making the rules purchase the only new investment. The downside to Scrappers is the rule book, which is quite dense and difficult to use as a reference during play. But when you start playing, it rapidly made sense and gave a fun gang level game, that we are already planning to play again. A little later Pete and Graham called down the Elder Gods in a game of Elder Sign. We then all joined in a game of Escape from Colditz, which in-spite of its flaws, proved to be great fun with a lot of laughs. 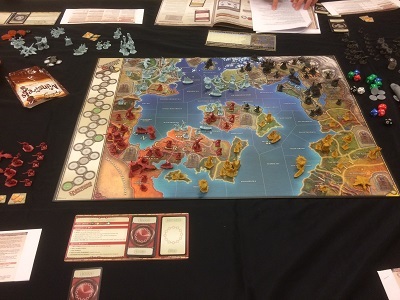 A quick detour into the card and dice game Age of War, which has a lot more depth to it than it first suggests, and then the day rounded out with a game of Puerto Rico – which was a first time for most of us, and the reason why this older game is considered a euro game classic, became obvious very quickly. Descent continued its journey towards the end of the campaign with part two of the Wyrm Turns scenario. 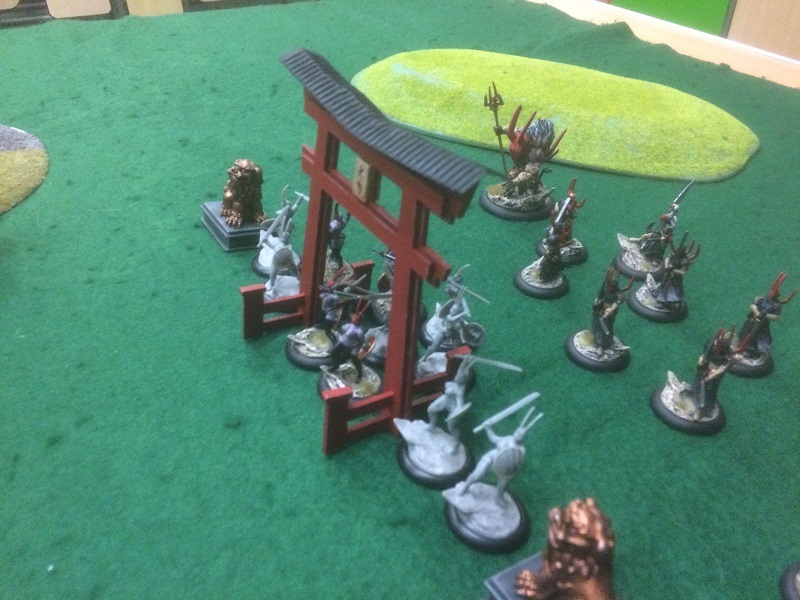 This saw the (so called) heroes try and stop the Overlord’s minions escape from the dungeon with the Red Dragon Skull. Despite Overlord Frank now playing with a little more organisation (he has a spreadsheet!) allowing him to target the heroes more effectively, the heroes continued their drive to complete the campaign with no losses. But it was a closer run thing than many of the proceeding adventures (the magic of Excel? ), with one dice roll probably deciding it. On the positive side, for the Overlord, the heroes didn’t get much loot from the dungeon (cue Evil laugh). The crew then moved onto the fun pre-programmed wild west themed game, Colt Express, which saw the wacky fight for the loot on the train. Always a fun story and inevitably, why doesn’t this hit the table more often. On the other table a four way game of Frostgrave raged on with Olly, Mark and Chris taking new comer Andrew through the streets of Felstad. This is always a fun game, with a D20 mechanic that can both make and ruin a Wizard’s day. Couple it to the fantastic terrain collection that the crew have, and its also a good looking game. That was the content of last night’s meeting of the BAD Gamers. 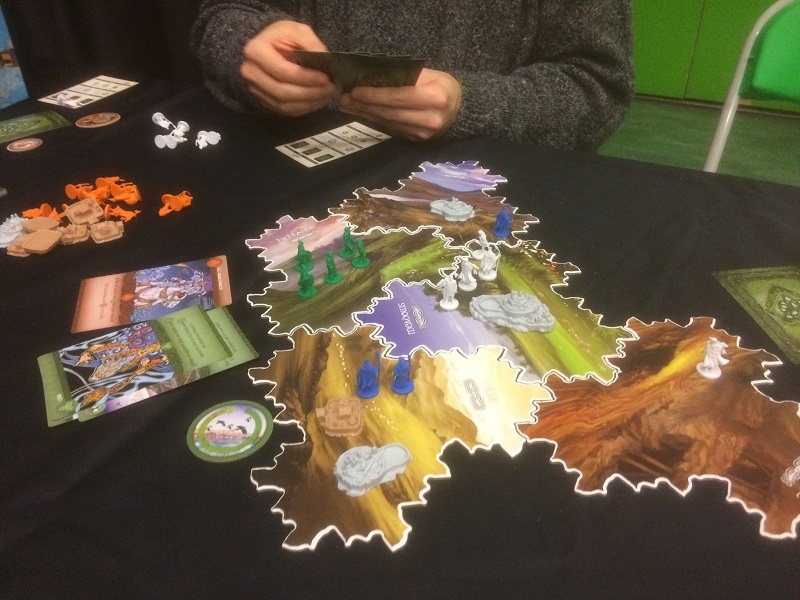 Tom, who hasn’t been around for a while, and is now secretary of the Banbury wargames club, NOW Gamers, came along and had a game of Wrath of Kings with Darren A. The RPG’ers played the dark ages version of Vampire and the rest of us played a range of board games with a loose area control theme. We kicked off with a game of King of Tokyo, which Chris and Lee took to a bitter end. Then we moved on to Alien Frontiers and new game Inis. This is an interesting mix of a 7 Wonders style drafting, an expanding map, an area control system and a choice of three victory conditions. It looks beautiful, plays fast, and after the first few turns players will understand the mechanics. After one game strategy will be understood. 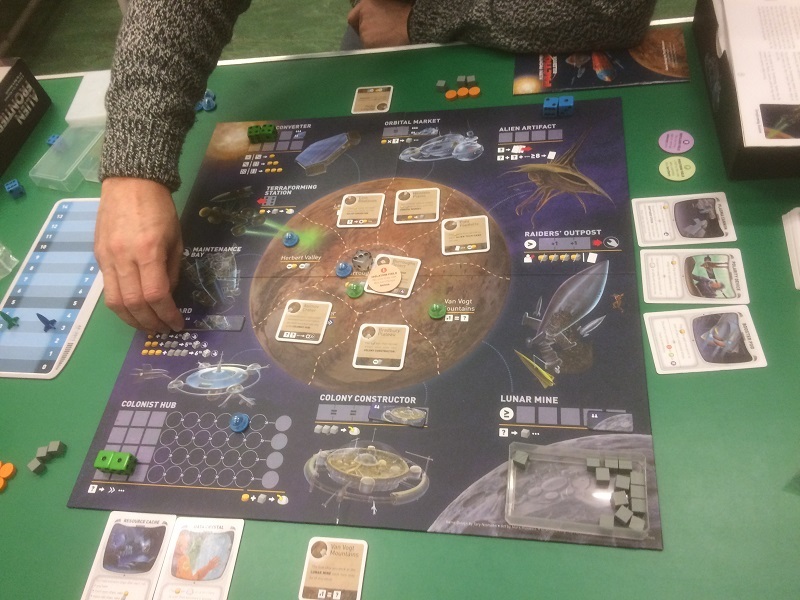 The evening then rounded off with one of Frank’s favourites, Onward to Venus, which has a strong tactical rather than strategic play but is also area control in nature. Martin, playing the German Empire took the win after playing a “very quiet let everyone else get on with the game” approach. Next week looks like Frostgrave and Inis plus no doubt, more. Only five of us out last night at the BAD gamers, but we got some good games in nevertheless. 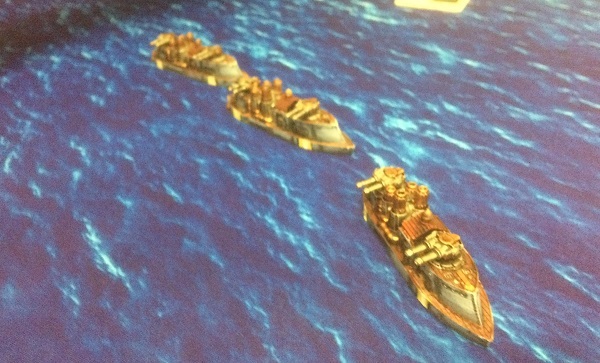 Ben took Darren S and Mark H through a starter battle of Dystopian wars with the East India Company coming to blows with the Polish- Lithuanian Confederation. Not sure how the geography on that one worked out, but the game was bloody and close, going down to the last ships on each side. On the other table Steve and Frank played a game of Sharp Practice ACW. 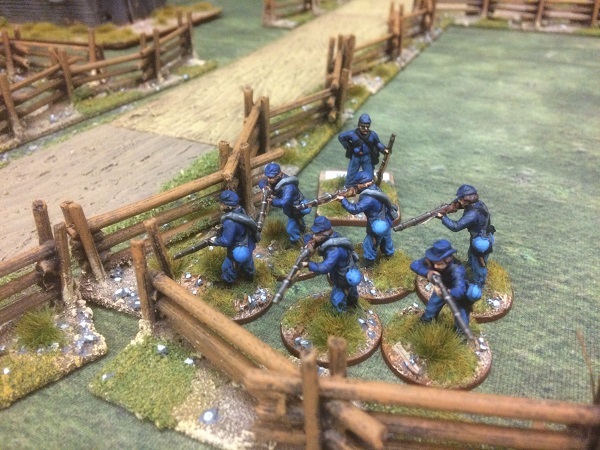 Set in 1864, Steve’s Yanks were attempting to sweep Frank’s Rebs from the table. 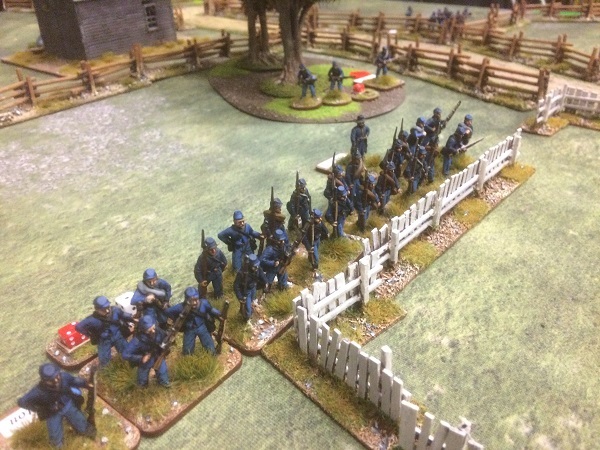 Steve pinned the Rebs on his left flank, avoided those in the centre, and broke through on his right leading to the collapse of the rebels morale. 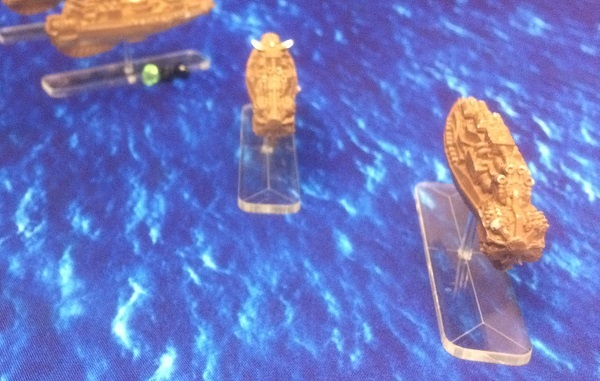 Frank blamed his lose on poor positioning and early deployment of his main unit. Both agreed the game was great fun. Both were good games, and it was great to get the toys to the table. Next week is RPG – modern Vampires and Boardgames. Possibly Inis and/or Conan. 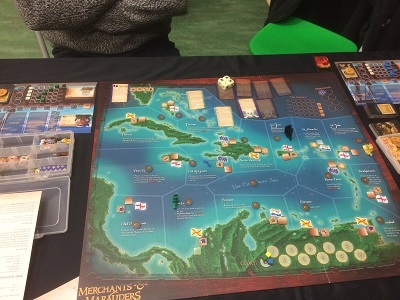 Mark, Lee and Frank took Merchants & Marauders for a spin. Been a while, and it showed in Frank’s ability to remember the rules! Still Lee created a good narrative as a merchant who found fortune through trading and then fame through taking down the local pirate (and in so doing winning the game). 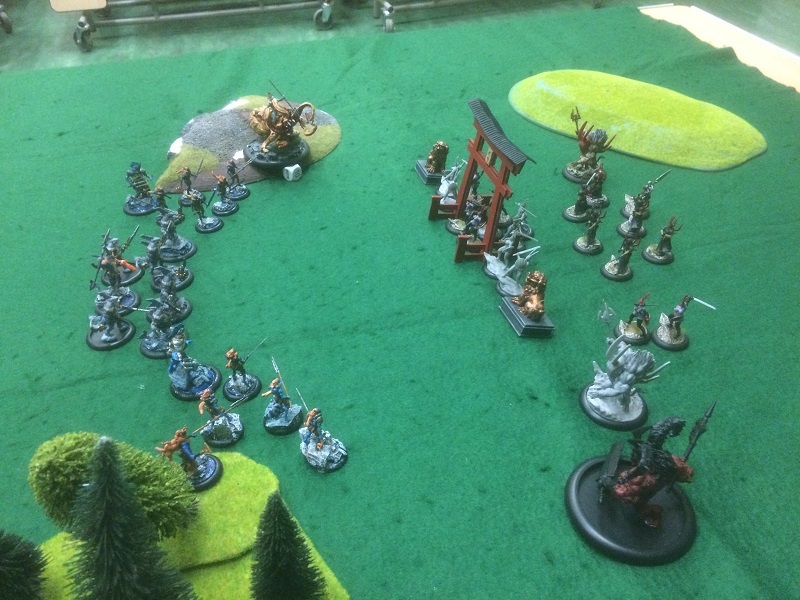 At the all day January session, Pete took Paul, Graham and Frank through Conquest of Nerath. A dudes on the map game set in one of the D&D worlds. The strategy needed to play the game evolves over time, making this more than a fantasy version of Risk. Indeed the euro situation of having too much to do and not enough to do it with came out in the middle of the game, meaning that every attack had longer term consequences. 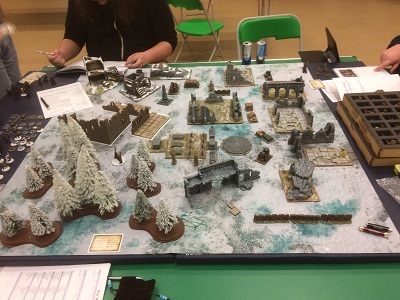 Also at the all day session Mark ran two games of Frostgrave, with his new gaming mat. Both games proved great fun, what with teleporting wizards stealing treasure, other wizards using telekinesis to move treasure about, and yet other wizards blowing themselves up while miscasting spells. 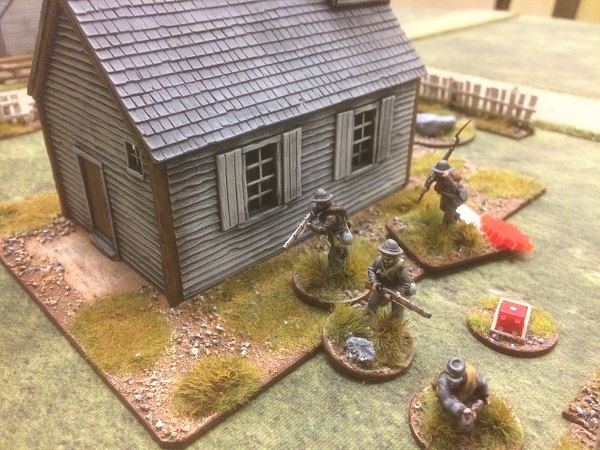 A fun miniatures game, and one that will hit the table again in the coming weeks. Additionally we played Carcassone, 13 Days, the Undercity, D&D Boardgame and Warhammer Quest. Its been a good January of gaming. 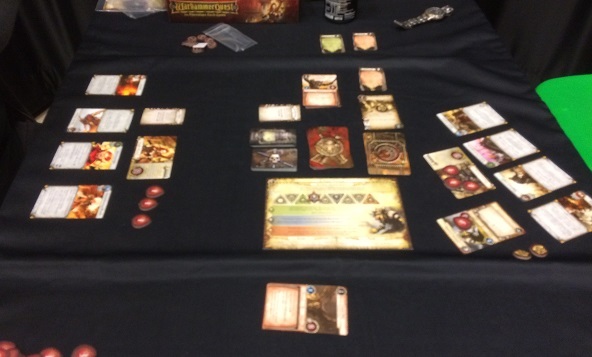 RPG night at the BAD Gamers last night, so while that group battled as vampires in the Dark Ages, the rest of us, and a new guy, Lee, took Warhammer Quest: The Adventure Card Game for a walk around the table. 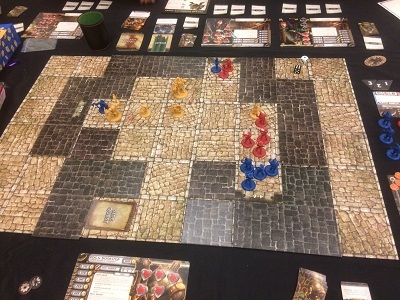 WH:TACG is a card based dungeon crawl based on the Warhammer Quest boardgame from the mid-90’s (in much the same way that FFG produced Space Hulk the card game, based on the GW board game). We started with the intro mission which required our intrepid (but stereotyped) group of adventurers – a wizard, a cleric, a dwarf and (you guessed it) an elf, to investigate a terrible stench and resulting disease coming from the sewers on the edge of town. We managed to battle through four areas to then get a final confrontation with the big bad – Grumpy something. The game plays really well, with the mechanics being simple but comprehensive. We worked as a team, and although we finished up very bloodied, we were successful. And it tells a story – putting the game somewhere between the boardgame narrative of a dungeon crawl like Descent and a full blown RPG like D&D (but without the need of either of them for an overlord/dungeon master player). Overall then a good game, with the only downside being that with the GW-FFG split it will be out of print very shortly.